The Alamo at Sunrise - Another capture of the Alamo at sunrise in San Antonio with the early morning color in the sky. The Alamo was originally known as Misión San Antonio de Valero and was founded as a Catholic mission in 18th century as a mission and fortress compound along with educational purpose for the American Indian. Today it is part of the San Antonio Missions National Historical Park and is a World Heritage Site. This historic landmark site is part of the San Antonio cityscape which draws thousand of tourist year round to come to the mission and discover the historic significance of this place. The Alamo is treated with a lot of reverence so be respectful when inside at all times. Today it is part of San Antonio greatest tourist attraction because of it contribution to history. During the revolution a small number of men 187 Texians were at the compound when the Mexican Army attacked and executed all the men who were left inside and burned some of the place down. Many know the history of Battle of the Alamo as William Travis and his men like Daniel Boon and Jim Bowie fought Santa Anna Army to the end. This was the what started the revolution with the battle cry of Remember the Alamo. Most remember "The Battle of the Alamo from their history books which took place in 1836 when San Anna with 5000 men took on the 187 men of the Alamo and executed them all. However it was a short lived victory for Santa Anna and his men who were later defeated by General Sam Houston at the Battle of San Jacinto. The Alamo was brought back to life by the Daughter of the Republic which started trying to preserve it and had maintained until 2015 when the Texas Land Office took over the site. Today it is probably one of the most popular tourist spots in the state of Texas. Most remember "The Battle of the Alamo from their history books which took place in 1836 when San Anna with 5000 men took on the 187 men of the Alamo and executed them all. However it was a short lived victory for Santa Anna and his men who were later defeated by General Sam Houston at the Battle of San Jacinto. We have many more mission please contact about other San Antonio Missions. 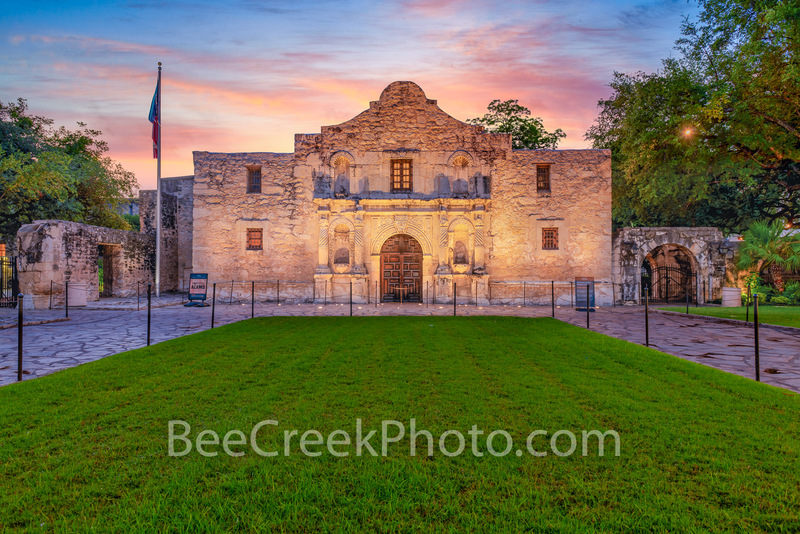 Today we captured the Alamo at sunrise, but we have many more from images if the Alamo at dusk, sunset and twilight. Photo © copyright by Bee Creek Photography - Tod Grubbs / Cynthia Hestand.